If you’re looking for expertly crafted handmade furniture, Philadelphia knows that A-K Custom Interiors is your one-stop-shop. We build all kinds of furniture, from headboards and wardrobes to offices and kitchen cabinets, with every detail customized to your precise specifications. Read on to see examples of our work. Whether it’s a space to do homework or negotiate the details of a contract, your workspace is a key component of your day. For those of us who work at home, carving out a quiet corner to get work done can sometimes feel like a struggle. But, when you work with an expert in handmade furniture, it’s possible to build the exact workspace you need without sacrificing space. We’ve designed large offices, areas suited for teams, studying nooks, and kitchen command centers. Whatever space you need, we can accommodate. When it comes to Philadelphia row homes, we know it can sometimes be close quarters. Thankfully, what they lack in square footage, they can make up for in charm. One great way to add a ton of charm to your master bedroom is to have custom wardrobe cabinets installed. 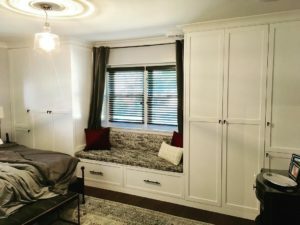 Of all the handmade furniture projects we complete, these are some of our favorites because of the dramatic improvement that new storage and organization brings into our client’s daily lives. You spend 1/3 of your life in bed, so you may as well love the way it looks. At A-K, we’re skilled at making bedframes and headboards in all kinds of styles. 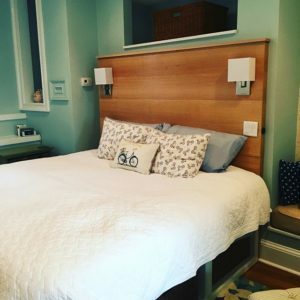 To see an example of how a headboard can be great looking and functional, take a look at the headboard in the photo above. This gorgeous red oak really sets off the room while saving these homeowners a ton of space. Having lights installed in the headboard saves precious square footage that’d otherwise be taken up by nightstands. When you choose handmade furniture, your customization options are limitless. Check out our portfolio to see more examples. For the best custom handmade furniture, Philadelphia trusts A-K Custom Interiors. Give us a call at 215-839-6659 to get your complimentary consultation scheduled today. 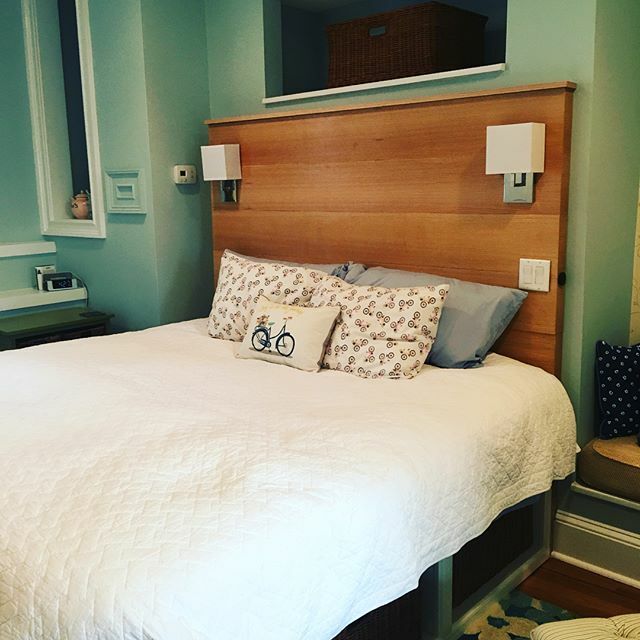 And, don’t forget to follow us on Instagram and Houzz to see our latest projects! 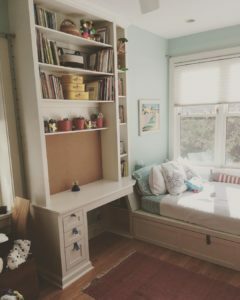 Next post: Which Custom Bookshelf with Desk Built-In is Right for You? 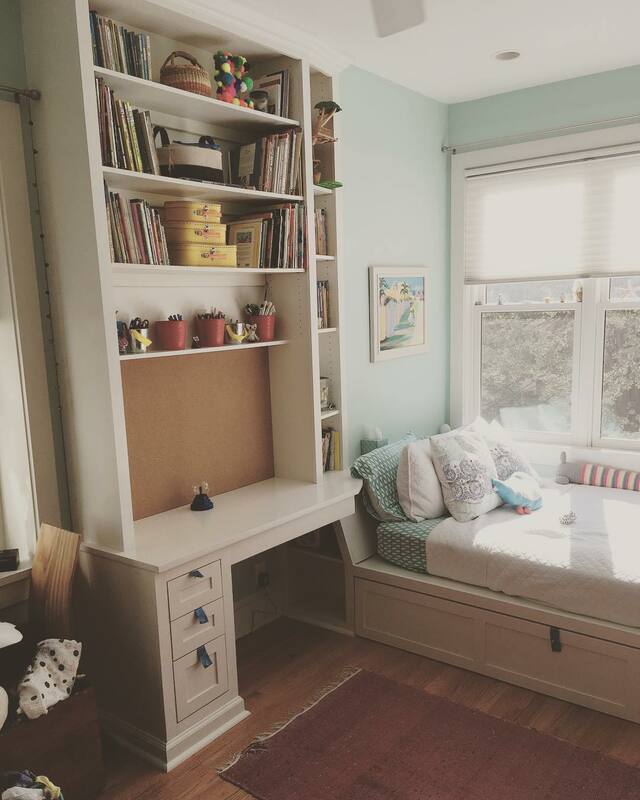 Previous post: From Initial Design to Finish Carpentry, Philadelphia’s A-K Customs Does it All!